Barb and I are visiting our son Drew and his wife, Kate, in Northern California (east of San Francisco). Last year I discovered an amazing Cadillac graveyard right up the road in Brentwood - A & A Automotive. The owner is Gar Tomkins, whom some may recognize as the builder of "Cadzilla," the low ride cruiser featured in some ZZ Top videos. Yesterday I went back to A & A. Over the past year I've spent about $800 with Gar for all three of my old Cadillacs. Larry Wilson has used him too, for his '65 Deville convertible. 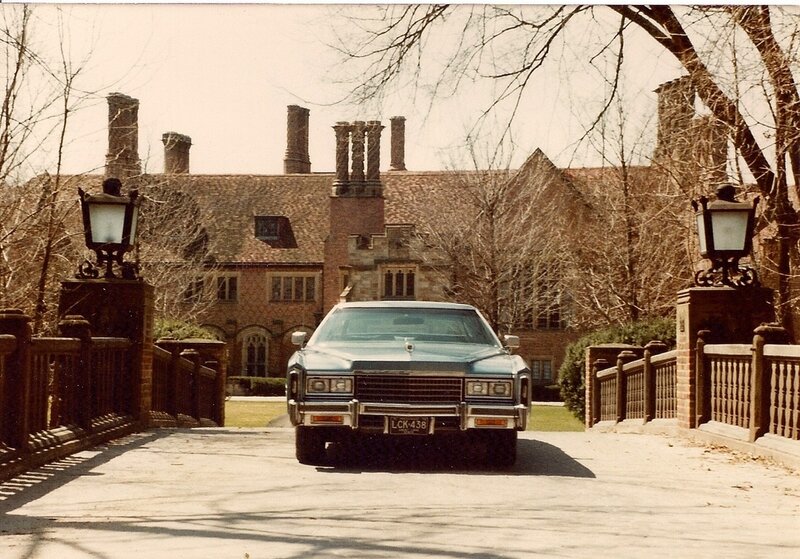 This trip I had a shopping list: a battery tie down for Lee Dunn's '76 Eldorado, a deck lock crest for my' 66 Eldorado, a door panel for my '58 sedan, a plastic trim piece for the bumper guard on my' 96 Brougham, and a long shot - a taillamp housing and red lens for the '66. Drew's father-in-law, Joe, drove me there and walked the yard with me. Joe's a car guy and retired aircraft mechanic, so he gets it... The hunt for parts is one of my favorite parts of the hobby. We stopped by and left my list with Gar, then started our mile long browse. To our right was a lineup of Cadillacs in great shape (three Cadillacs). Next, a '61 convertible backed in front of a shed full of scrapped engines and transmissions (white car under tarp and two more photos of trans and motors). To our left we came around a corner to see the long view toward the back of the yard. Hoods, fenders, deck lids as far as the eye can see on our left. Maybe 150 yards to the back fence (long view). I paused halfway down the row to show how Gar stores his large body parts... Yards and yards, sorted by year, labeled so you can find them. (halfway down the row)... Looking back toward the entrance, it's mind boggling to consider how many CADILLAC ONLY parts Gar has. (looking back). If you ever need a replacement for a bashed door or fender, Gar's your guy. All along the way on our right are storage containers full of sorted parts. Up above are a few select whole cars. First was this white '57 Eldorado Seville. (eldo Seville). Next is a' 58 Sixty Special (58 sedan) and a red 57 Eldorado Seville. (red Seville). Inside the storage containers are tins of sorted mirrors, ac components, distributors, grilles, on and on. (assorted parts bins). On our walk back out we found a number of wrecked Cadillacs (a 64, a 53, etc). I told Gar I'd be back in a day or two to pick up the parts on my list. I might just walk this place again. I'm getting my miles in while entertaining myself. Shopping here is better than at Home Depot! When you've had the same Cadillac convertible for 45 years, you become known for the car you drive. When the Cadi pulled on the field at the Superbowl half time show, my phone started beeping with texts and emails wanting to know if "that's yours". TBS had used my car this summer for a documentary so that made it even more of a question by those who knew. But the car in the Superbowl ad was a 1970 Coupe De Ville convertible. Mine is a 1972 Eldorado convertible. I'm not sure I would have let my car be used as the one was being used in the half time show. When TBS used my car, they went overboard to take good care of it. Here's a picture from TBS studio. 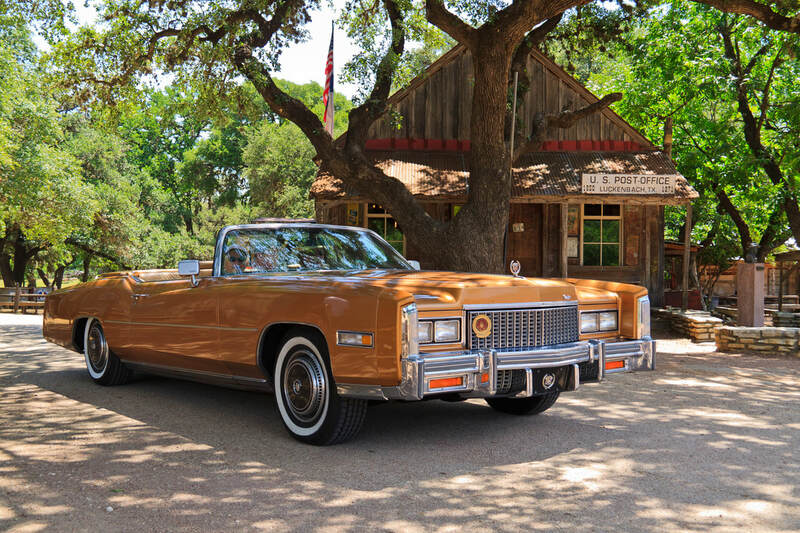 Lee and Mary Jean Dunn purchased this 1976 Cadillac Fleetwood Eldorado convertible in December 2011 with 12,506 miles. Known as 'Goldilocks' the car has received three Preservation Awards at Cadillac Grand National events along with a 3rd place in class, 2nd place in class and in 2017 a first place in class. In 2018 we received the CLC Hard Luck Award due to a tire blowout. The car remains all original in exterior paint (Amberlite Firemist), interior leather (Buckskin) and drive train with 500cc engine. The top was replaced in May 2018, due to splits, with OEM Buckskin. At the return of our 2,504 mile trip to the 2018 Grand National the odometer read 35,121, an average of over 3,000 miles per year in our ownership while sharing road time with our '57 sedan. Debbie and I just got back from the AACA National Winter Meet in Mobile. The location was changed a while back from Puerto Rico. 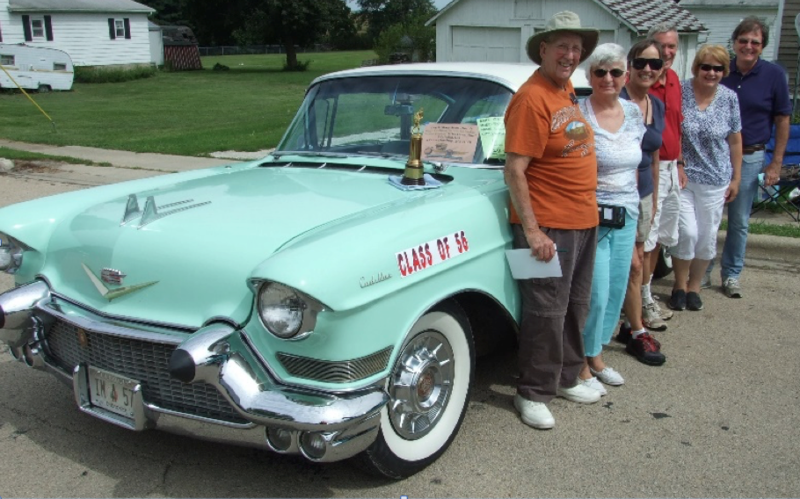 I have attached some photos of Cadillacs that were there for the judged show on Saturday (see below). We were very happy to meet and get to visit with Paul and Janice Phillips and see their beautiful 1941 Fleetwood 60 Special in person. We also met Dennis Manieri from Florida with his cream 1941 Series 62 convertible sedan, an AACA Senior car. The other '41 in blue is the convertible coupe owned by Jerry Peterson whom we did not meet. I do not know what awards they won. The '58 Eldorado on the show field is owned by Warren Lovell. The '37 convertible sedan is part of the Jim Henderson collection we visited on Thursday. Hope the BOPC goes well in May. We will be in Auburn, IN for the Spring AACA meet, Nash club show, and RM auction. now owned by a young man in Abu Dhabi. George Celani was a driver of big rigs, delivering Cadillac parts to the assembly plants for at least two decades. He wore a Cadillac vest and had a spotless accident-free record. Lee Dunn bought his donated memorabilia at last year's Christmas banquet, to benefit the club. Lee and Roger Williams recently arranged to meet Mr. Celani in Eufala AL, to obtain some other memorabilia, and shared the story with both Steve Stewart at the CLC Self-Starter and with Tim Pawl at the CLC Cadillac & LaSalle Museum/Research Center. Steve wanted an article and Tim wanted the items for a display at the museum. This is all in process, so look for the article soon, and the display in future months. Meanwhile, Peach State's board agreed to honor Mr. Celani with a lifetime membership in the regional club, and we bought him a membership in the national club -- so he can see how we appreciate his service to the Cadillac marque. Barbara Williams shares pictures of the Seville that was gifted to her by her son, Logan, in 2012. Doug, I am in Northern Michigan (top of the mitten) and planning to drive my newly acquired 1955 Fleetwood home the 900 miles from here to Marietta. Hoping to avoid breakdowns and get home in advance of Hurricane Irma. Planning to leave here Friday afternoon or Saturday morning. Have been working on the car intermittently for the past couple of months to get it ready to go on this long journey. Have overhauled the suspension (new springs, rubber pads and bushings and shackles, new Bilstein shocks, new fat ADDCO sway bar, etc. ), installed a seat belt, installed new Pertronix/coil/plugs/plug wires, improved some wiring issues, fixed the horn and some lights, and eliminated tons of squeaks in the car (especially behind the dash while I have the dash pad off). It should be ready to go and I expect/hope for an uneventful drive home. Jeff is in the middle of a complete restoration of his '56 Cadillac Coupe convertible. As you can see in the photos, below, he has been working on painting the body. Jeff notes that he still has the doors, hood, trunk lid and fender skirts to complete. Stay tuned for more photos and updated status on what promises to be a gorgeous automobile! Great job, Jeff! A `Milestone` was reached this week with our 1954 Cadillac Eldorado over here in the UK. It’s 50 years today since my Dad bought it and registered in our family name . Since then it has been ‘on the road’ every year and is treated as part of the family. Below are photos and captions of just some of the many ‘events’ and ‘personalities’ we have been associated with over the years. Doug's intro + 60th Anniv. Pkg. 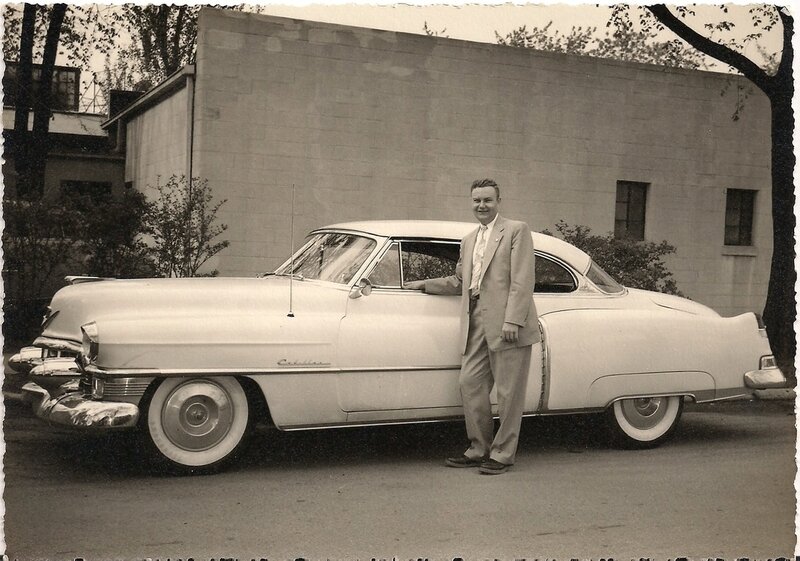 Dad standing by his 1953 Cadillac near the side of my grandfather's photo studio on Woodward Avenue, Detroit.